Presenting to club members, Sophie Hensley and Chloe McKerr discuss upcoming yoga related events. Club Younity strives to bring spiritual awareness to the South student body. Junior Chloe McKerr sits silently on the floor, focusing solely on her breathing, as she tries to connect with her spiritual self. Despite her stressful schedule, which involves balancing lacrosse, school and her social life, she still carves out ten minutes of her day to meditate. According to McKerr, she along with senior Sophie Hensley, are passionate about spreading the idea of spirituality and mindfulness. Their passion has lead to the creation a new club at South, Club Younity. “The definition of Younity is to be one with yourself and the world around you,” McKerr said. 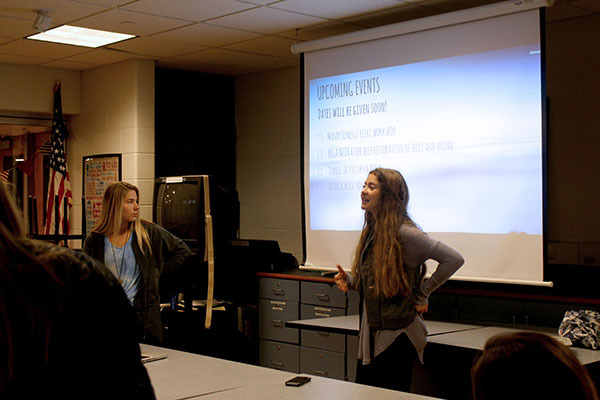 According to Hensley and McKerr, the club strives to bring spirituality and mindfulness to the GBS student body, and make students more aware of their unconscious mind. McKerr and Hensley believe that everyone can be spiritual, despite varying religions. According to McKerr, the club wants students to understand their role in life outside of school and their social circle. “During school you are so focused on homework, your social life and what’s going on in your world. It makes you realize that you’re more than just you in this little body, and you can focus on the bigger and better things of life,” McKerr said. According to McKerr, along with Courtney Middleton, health teacher and Club Younity sponsor, they not only want to lead the club activities, but they want to learn and discover the different aspects of spirituality along with the other Club Younity members. According to Middleton, she decided to sponsor the club despite her inexperience with spirituality and meditation. “I’m hoping to learn about this through the different field trips and things we are going to do together as a group, and kind of discover how I might be able to implement some of these strategies in my life,” Middleton said. According to McKerr and Middleton, this club is just starting to take off, but they would like to further expand its reaches. Middleton believes the club is very eye opening and beneficial to students and would like to see the popularity grow. “I think it’s something that some kids overlook and don’t understand the power of, so I’m hoping that we can bring together the GBS community of students to kind of recognize how linking together spirituality, mindfulness, meditation, things like that, can really benefit them in their everyday lives,” Middleton said.